Clock (Toughness: 2) - Slow and earthbound. Easy to avoid and easy to destroy. Not much of a problem. Umbrella (Toughness: 2) - Travels horizontally and drops water droplets. 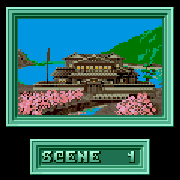 Not much threat here in scene 1 as long as you are careful, but are often in annoying places in later scenes. Chair (Toughness: 4) - Walks on the floor and flies cushions horizontally. Very fast and tough, and dangerous to fight, but easy to avoid by hovering. The Secret Bonus is above the first phone booth. Rather easy to get, with food pots and weak enemies all around it. To get the last blue jewel up high, you can either ride the broom, or if you have the P power, you can jump from atop the ? box down below with Naoki. Easily within plain reach. Contains Bunta. Clear the enemies before opening it - if you die after opening the jar and before you pick up the content, it will be lost! If you get the Secret Bonus before opening the jar, you'll find Makoto here instead. You'll still need to get the All Gold Bonus in scene 1 in this case, in order to get Bunta in scene 2. This scene is just the introduction and warm-up. 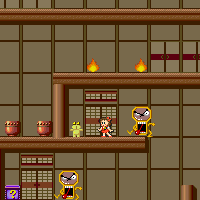 The enemies are weak and easy, and there are few terrain hazards. Most of the scene can be played with either Naoki or Akiko with no problems. There are two fake floors. The fires below the first one are false ones, so there's no real danger. If you fall down the second one, you can easily jump back up if you are using Naoki, or if you have the P power, or if you have left a food pot below it. Anybody can easily get All 100%, and the intermediate player should try for the All Gold Bonus so that he can get the Espers sooner. Even if you open a wrong food by mistake, don't give up: you can return from any place in the scene to anywhere, since all but one of the ON gates are two-way, and the one-way gate can be circumvented through the fake floor. In the first two scenes, where Satan's room is at the top of the scene, you can easily hit Zara as you enter if your timing is right, since Zara flies below you but flies up, past you, to escape as you enter. Just wait for Zara at the last gate. If you can ride the broom against Satan in scene 1, the fight is basically over. Akiko is preferred for this fight. 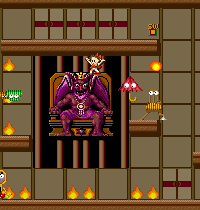 If you're riding the broom or if you're very good with controlling Akiko's hovering, you can approach Satan from the left, through the fires. Otherwise, you have to go around and approach from the right. Avoid the light switch by hovering above so that you can see clearly, and approach Satan from above, hovering along the ceiling, so that you don't run into the Chair or the Umbrella. 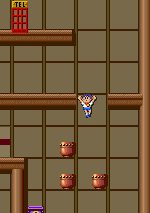 With Akiko's hovering, you should be able to defeat Satan quite safely. The ? box inside Satan's room contains only a Smiley. Don't bother unless you're in trouble and need to deploy a Stop icon. There are only 4 sets, and you can finish 2 of them by the time you reach the magic jar, and the enemies are weak, so modulus counting should be quite easy. When you're not sure, see that the food is of the right type before picking it up. It is recommended that you get the sets in their original order. If you find yourself losing the count too often, you have been doing too much fighting. Try to do less fighting and more evasion. If you feel that the Secret Bonus is difficult to handle, you may get the 4 food pots beyond the heavy door before adjusting score for the Secret Bonus. This leaves only 4 bowls of miso-shiru, so you don't have to maintain the modulus count. When you come up to the next group of 5 food pots, if your first hit reveals a bowl of rice, simply don't pick it up, hammer once, and collect the other 4 food pots first. 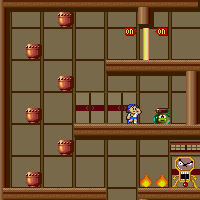 Alternatively, you may climb up through the fake floor and finish the third set with the food pots above before adjusting score. This page was last edited on 13 December 2010, at 16:43.